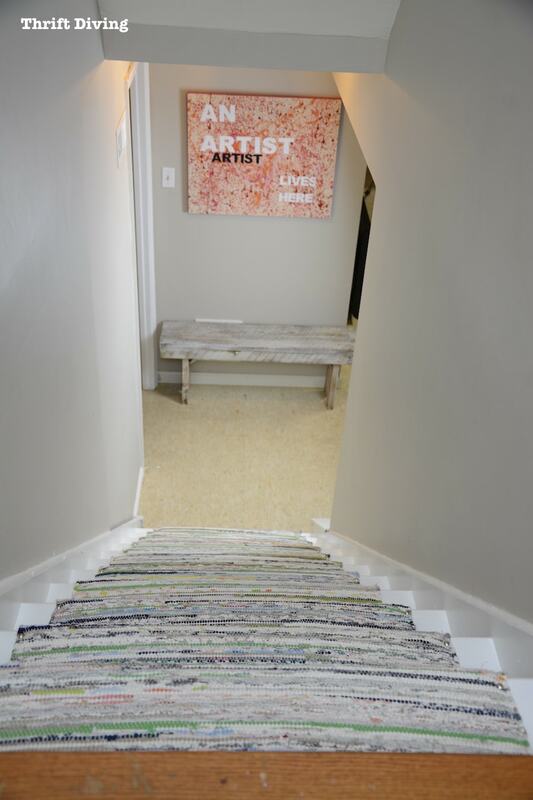 A couple years ago I saw a DIY painted stairs makeover that I bookmarked in a tiny space in the back of my mind and thought, “Whenever I get a free moment, I’m going to do my DIY painted stairs makeover the exact same way: with IKEA rugs and upholstery tacks! 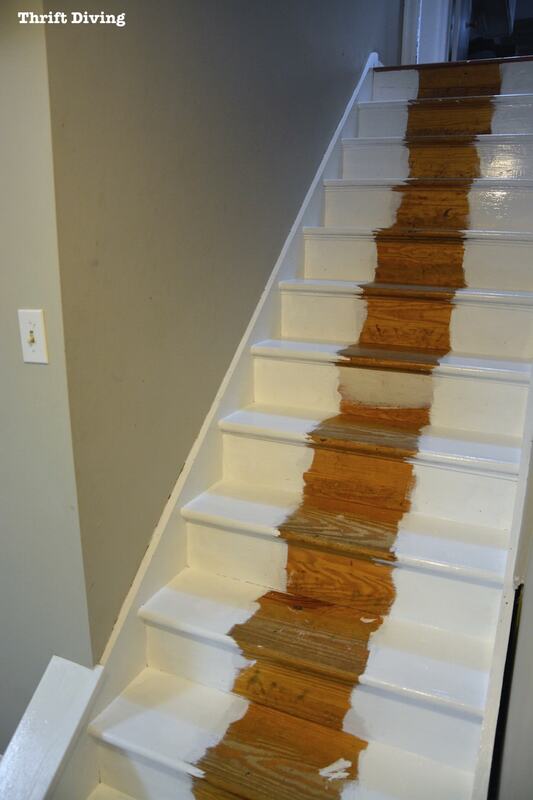 Here’s what my stairs looked like just 24 hours ago. And by the end of the day, this is what it looked like. (I’m not going to lie: I retouched the walls in iPhoto because they’re icky with “kid gunk” and I haven’t gotten around to painting the walls over yet). 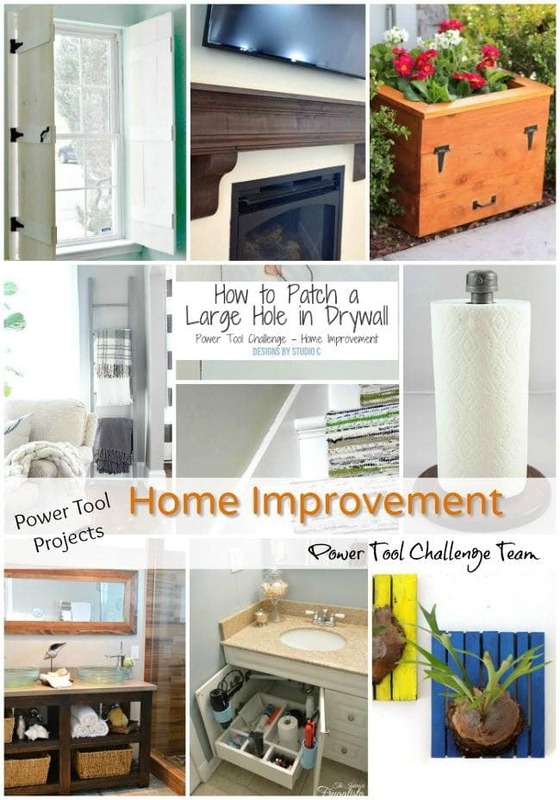 Anyhow, my blogger friends and I do a monthly Power Tools Challenge and this month’s theme was Home Improvement. It was the perfect challenge to knock this project off of my “Gotta-Get-Rid-of-the-Ugly” list. It’s amazing how you walk by something every day but never notice how bad of condition it’s in! 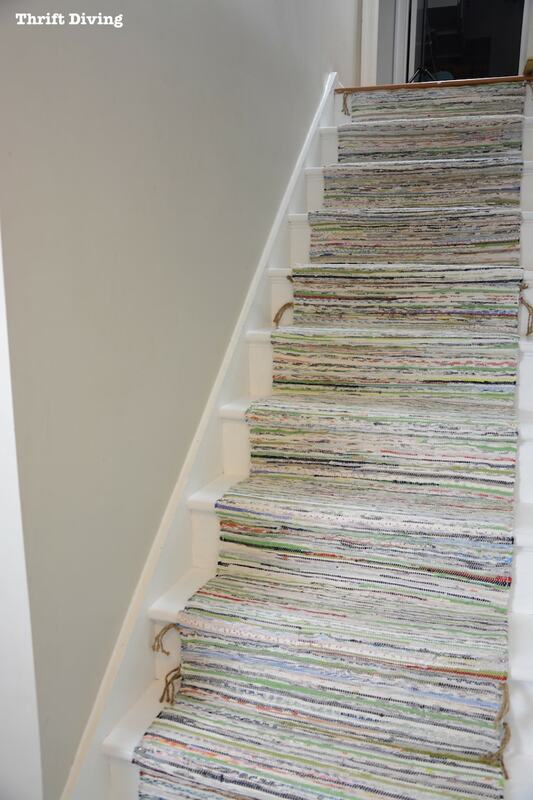 If you’ve got stairs like this and you want to do a DIY painted stairs makeover with inexpensive rugs, it can be done! I have another confession: I waited until the last minute to get this project done in time for the monthly challenge because I had spent all my time working on my repurposed kitchen cart project earlier this week. As a result, I was rushed, rushed, rushed, and decided to just skip any kind of sanding and just wing it with the left-over semi-gloss paint/primer. 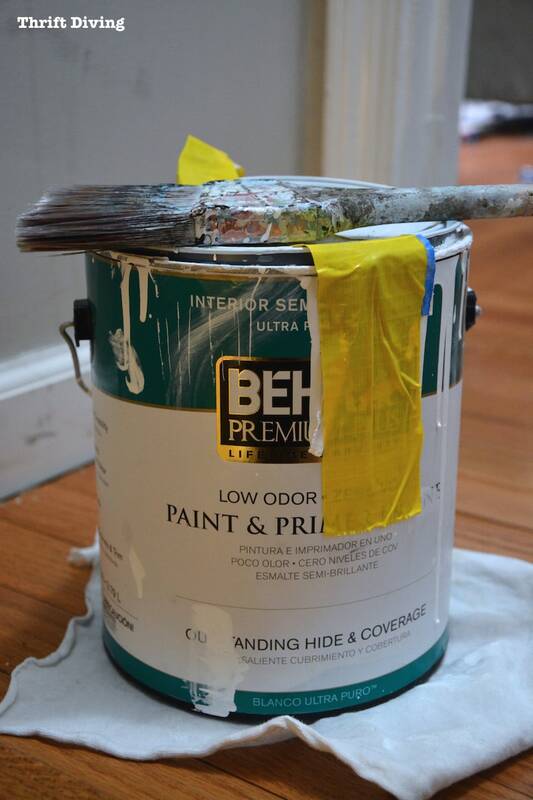 I was so nervous I would come back a few hours later with paint peeling everywhere. Thankfully, it didn’t happen (although that’s no guarantee since I haven’t yet unleashed my 3 little boys onto the stairs yet….). 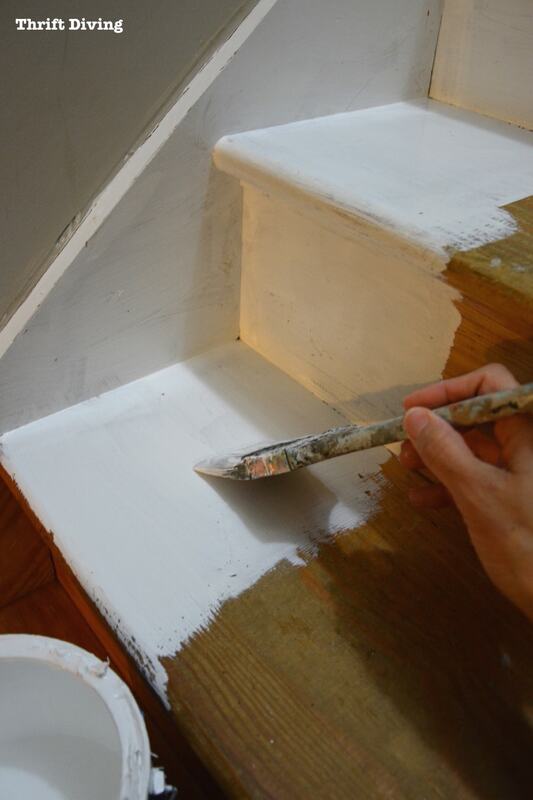 I slathered on two coats and skipped the middle section just to save time and paint. Who’s going to see it, anyhow, right?? (notice the dirty walls, though?? UGH). So…..about a year ago (yes…that long ago! 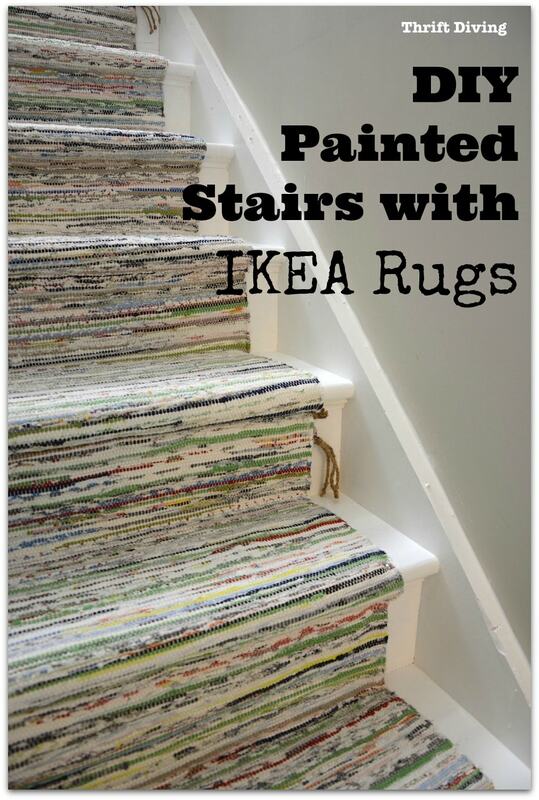 ), I bought these little IKEA rugs for a few bucks each, thinking I’d use these for my DIY painted stairs makeover. I loved the stripes, and the blue was awesome. 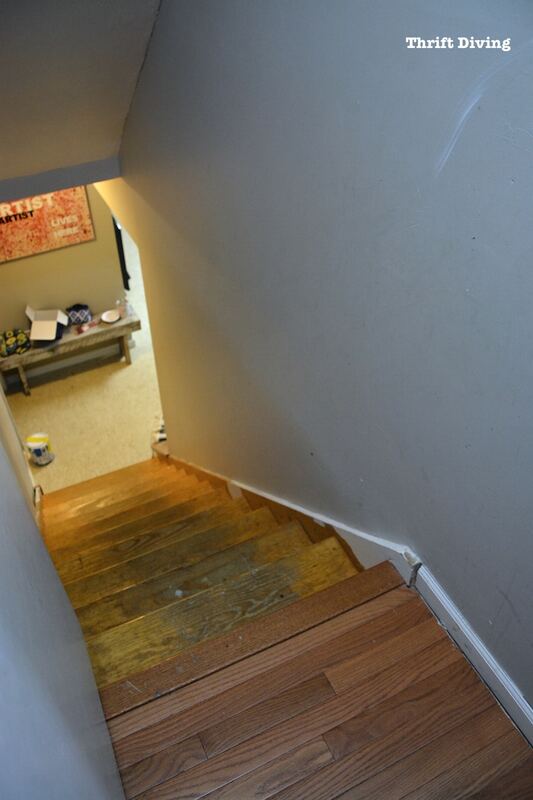 Only……after I laid them down on the stairs, it was like a landing strip: NARROW! That wasn’t going to work. I needed a Plan B.
I tried to get creative and turn them sideways, but no, no….that looked funny, I think. It’s like trying to wear a horizontal striped shirt: it just doesn’t do anything for your shape. I definitely needed a Plan C.
Plan C involved hopping into my van and heading to IKEA 30 minutes before they closed, hoping to get more of those blue striped rugs, so I could “make it work” as Tim Gunn would have told me. You know…maybe stack them in such a way to make them wider. But when I got to IKEA–surprise! 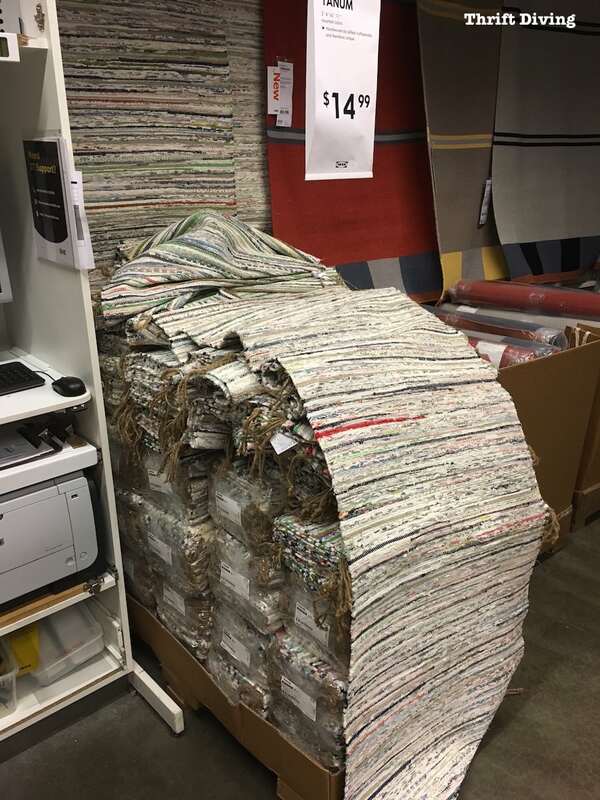 !–they no longer have my rug in stock. When have you ever heard of IKEA no longer carrying an item?? 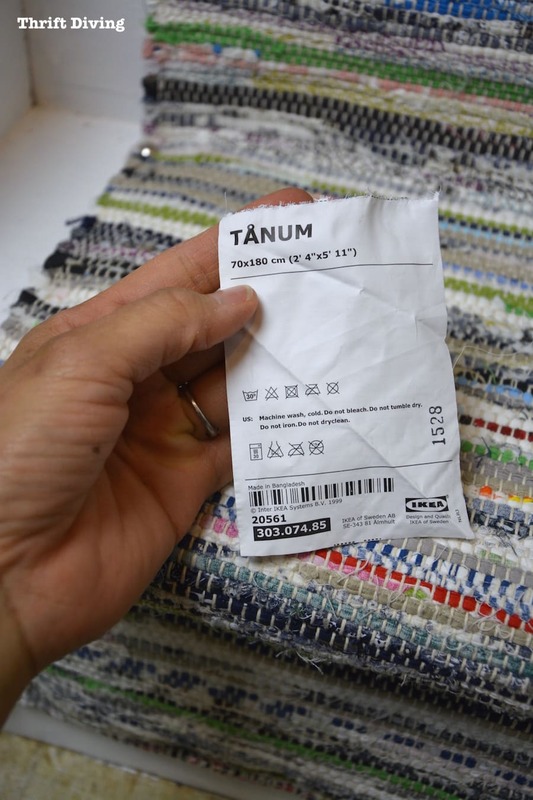 Then I saw these: TANUM rugs for $14.99. 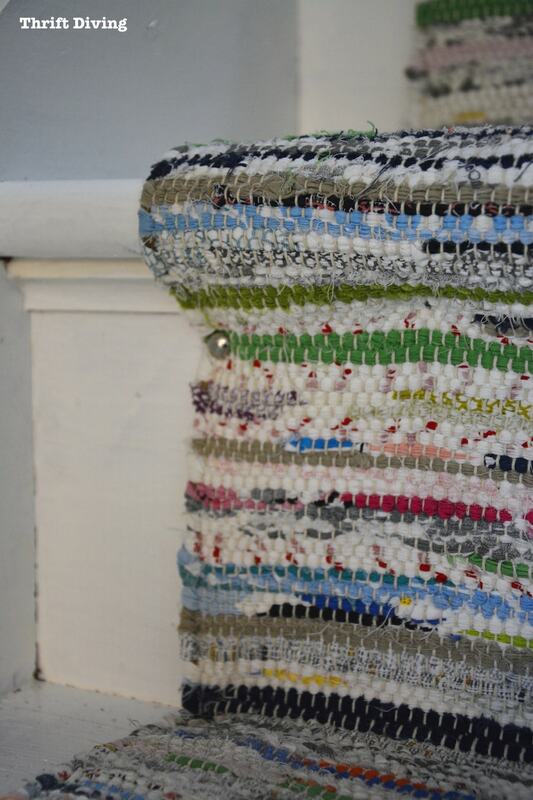 They were not my style, but I was impressed that they were handwoven. So for $47, I could get three of them and that would be a sweet deal! 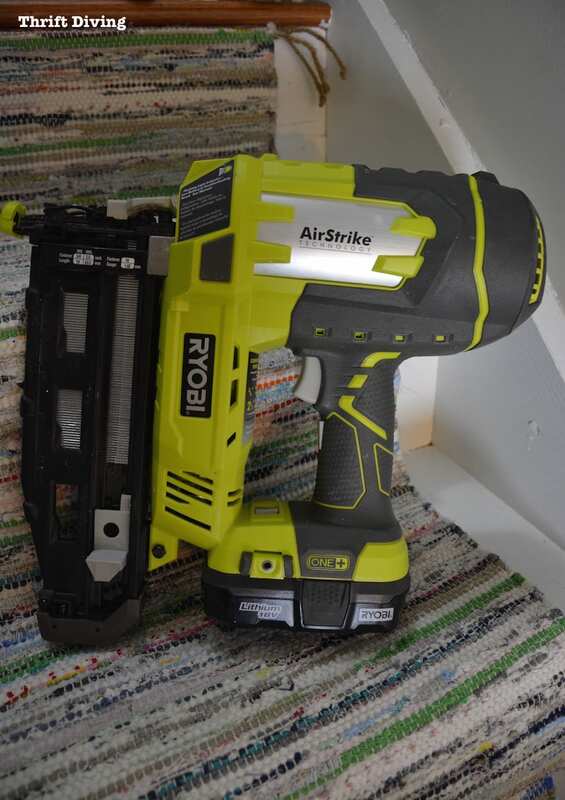 I pulled out my RYOBI AirStrike 16-gauge nailer, which I planned to use to nail the rug in place under the tread. 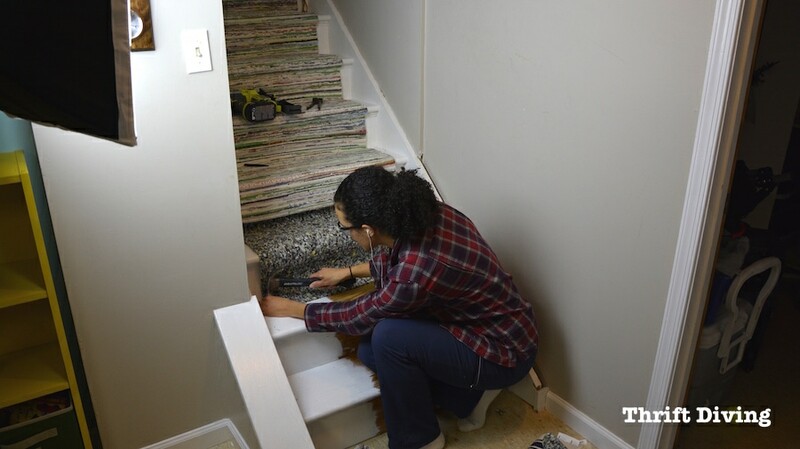 But first, I had to add the rug pad. 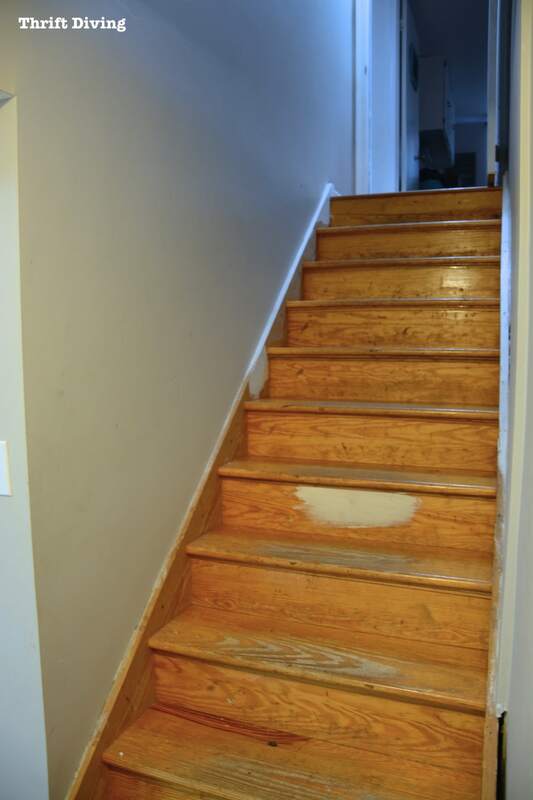 I laid that down first and used carpet tacks to help it stay in place along the edges. I just used a hammer for this part. 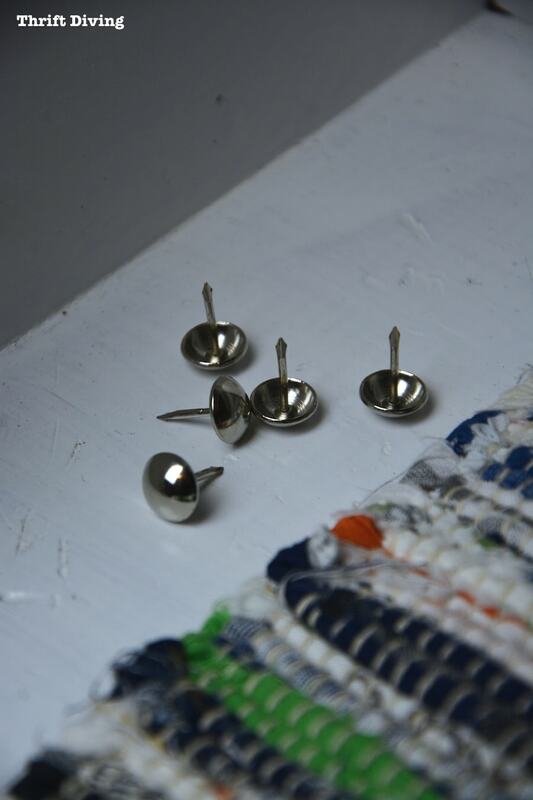 My main concern was to make sure no sharp tacks or nails were left poking out so we don’t cut our toes! 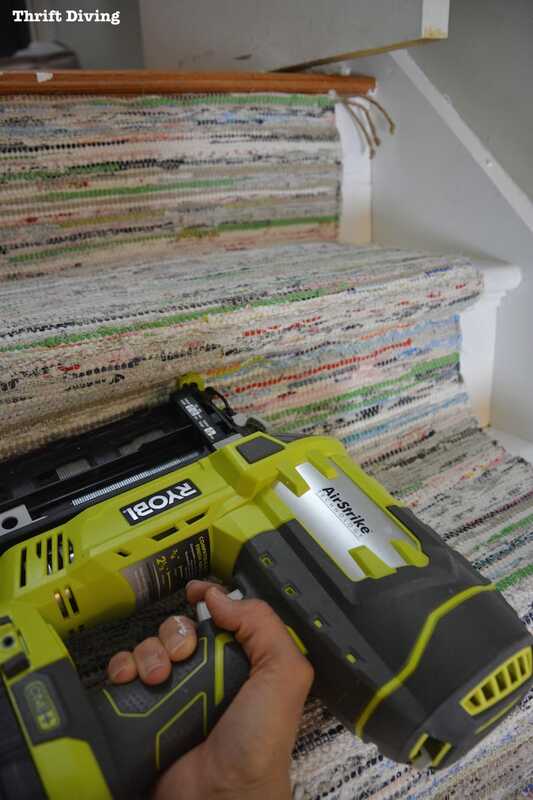 Then I laid the rug down over the carpet pad and used my nailer and drove nails along the underside of the treads. 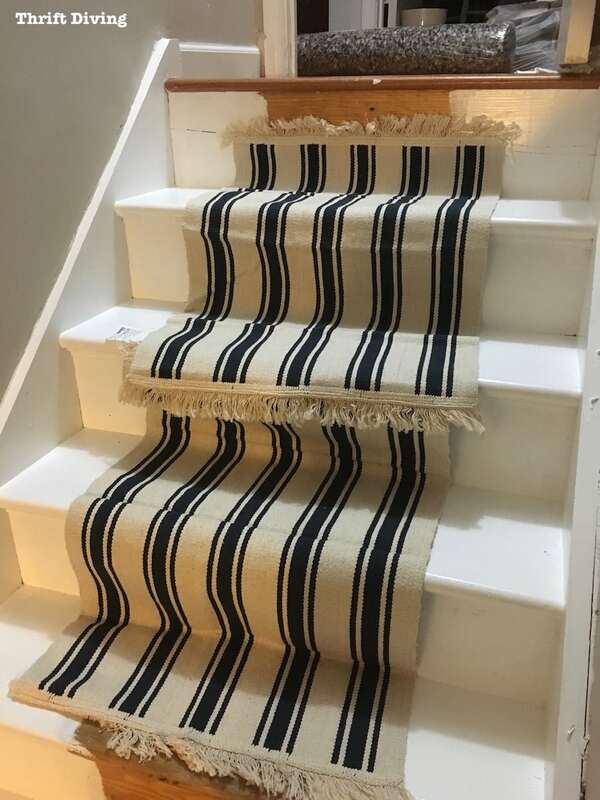 I really wasn’t sure it would work since it’s a woven rug. But thankfully, it worked! 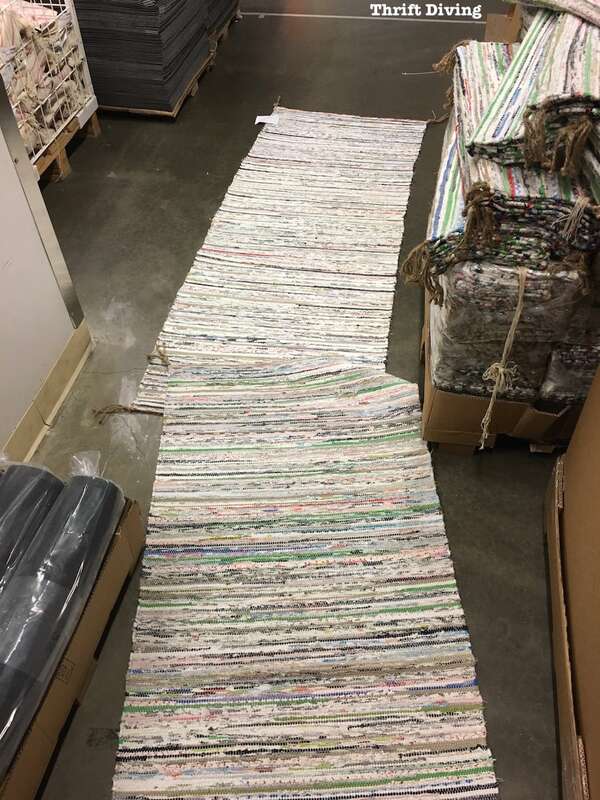 It wasn’t perfect because they are woven rugs. 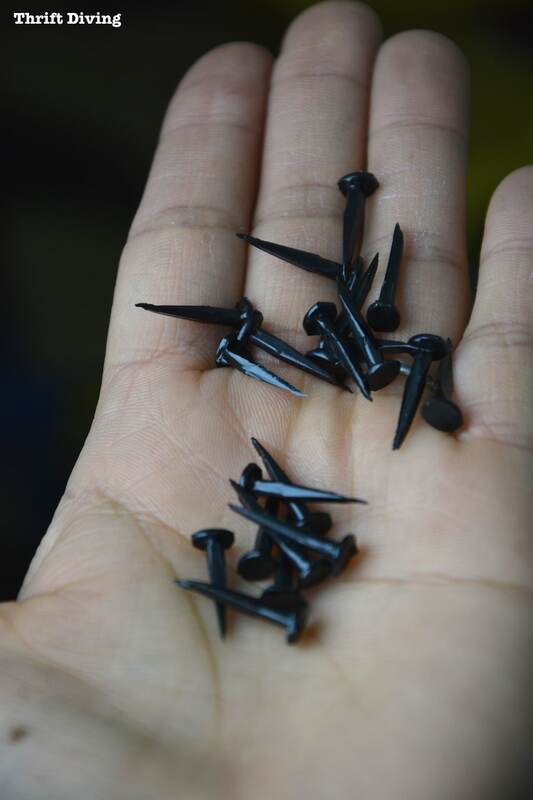 I was hoping since 16-gauge nails are thicker they’d hold up well. We’ll see how it does over time. 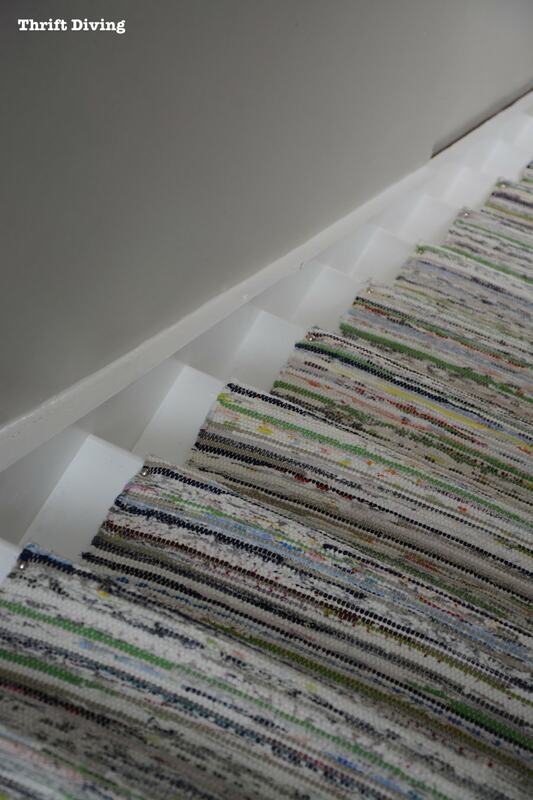 The upholstery tacks were perfect for keeping the rug in place, too. I placed most of them along the tread, but a few of them I added to the risers. I added probably about 10 or more nails along the tread underneath with my nailer, too. 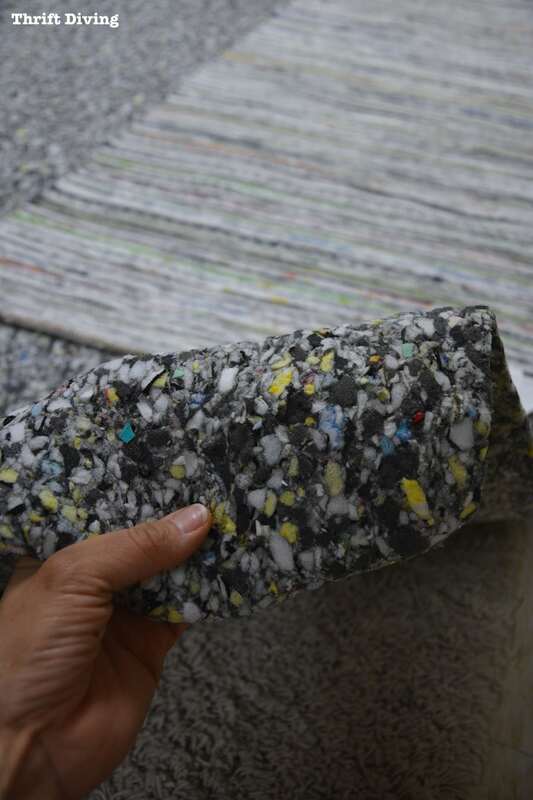 And since I used 3 rugs, when one rug would “run out,” I would start the other rug right underneath of the tread where the riser started. 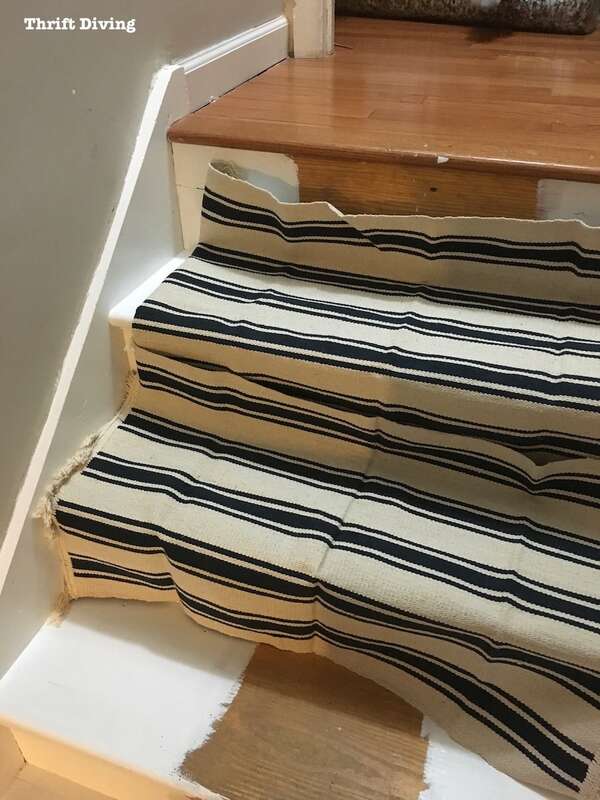 Since it’s a lot of patterns and colors, it’s not even noticeable. Score! 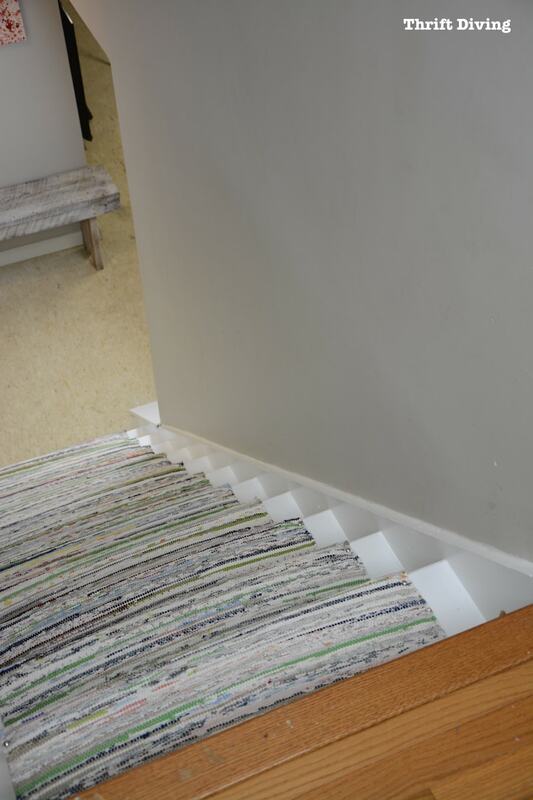 And although this wasn’t my first choice of IKEA rugs for this project, I’m super glad it was affordable and still makes my basement stairs look like an improvement! I actually really do like it! 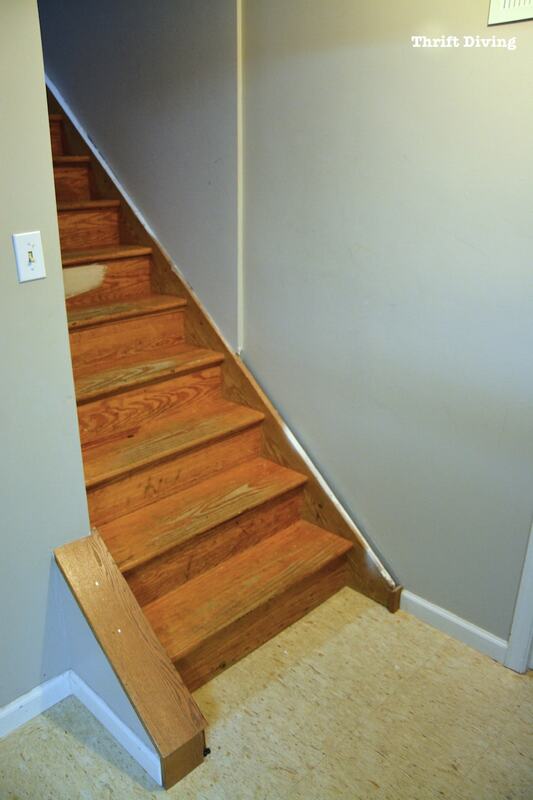 We still need to get a rail….and to repaint the walls to freshen them up a bit. But overall, I love the way the basement is coming together! 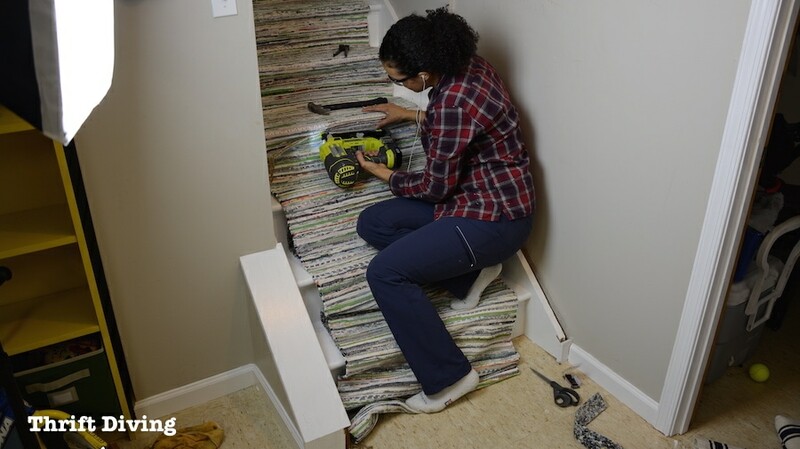 Have you guys ever done a stair makeover? What did you use, and how much did it cost? Let’s chat about it in the comments section! And before you go, be sure to check out the other cool projects from my blogger friends! 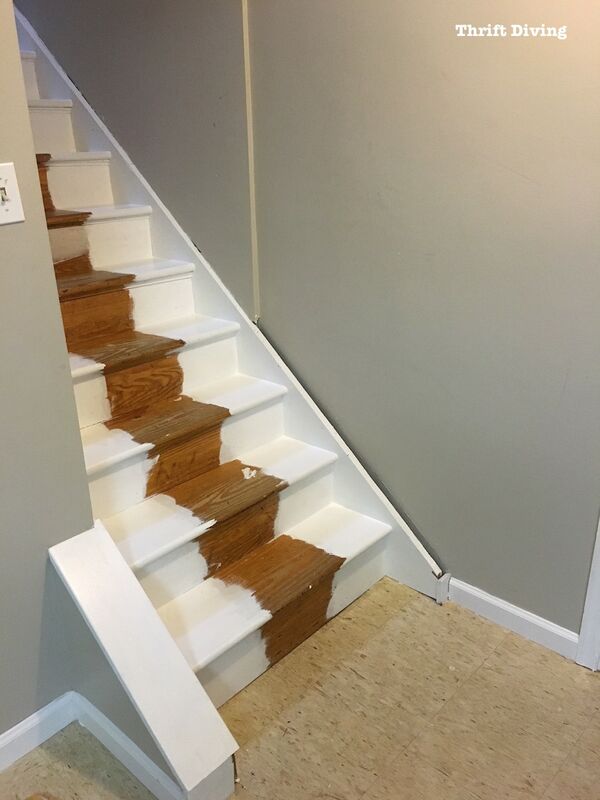 Love how your stairs turned out. 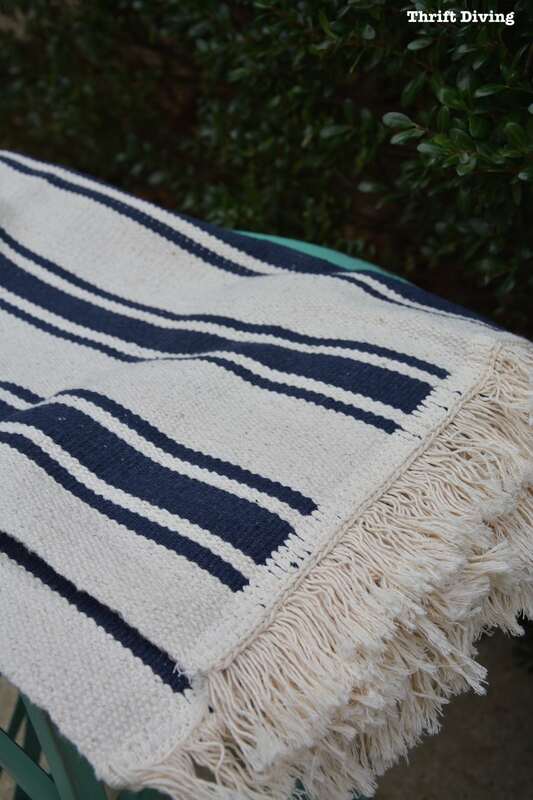 I’ve been looking for throw rugs like this for a coffee table redo. Unfortunately, we are not near an Ikea. 🙁 Visiting from Inspire Me Monday party.